In addition to being Washington, DC, wedding photographers, we have also photographed many a Baltimore wedding. DC wedding photography is not just taking pictures of Washington-based newlyweds on the National Mall. The broader Washington, DC, metro area includes the Charm City, and that city hosts lots of great marriage celebrations. We had photographed dozens of Baltimore weddings and love helping Baltimore couples document their nuptials on film. From the Inner Harbor to Cylburn Arboretum, there are lots of great venues for a Baltimore wedding ceremony or reception. Brides and grooms who want their Baltimore wedding to have a local vibe are spoiled for choice! The Quintessential Gentleman (or QG) is a great Baltimore institution at which grooms and groomsmen can get a shave before the nuptials. We have had the pleasure of photographing two grooms getting ready there and cannot wait for the next opportunity. There are also great venues for a Baltimore wedding outside of the downtown area. As Washington, DC, wedding photographers, we have photographed many marriage celebrations in that part of our metro area. For example, the Baltimore wedding ceremony featured in this image took place in the suburban area between Baltimore and Washington. The bride got into her wedding dress and the groom put on his tuxedo at the Hilton Baltimore BWI Airport. From there, their entire Baltimore wedding made their way southwest to St. Mary of the Mills Catholic Church. That house of worship is situated on the Patuxent River in Laurel, Maryland, almost exactly halfway between Baltimore and Washington. As a venue for DC wedding photography, St. Mary of the Mills Catholic Church offers something other churches do not. The lighting inside is bright and even, allowing brides and grooms to look their best in their matrimonial photos. Washington, DC, wedding photographers like us always want our fiancés and newlyweds to love how they look on film. So a DC wedding venue that makes our jobs easier is always welcome! One of the other nice things about this Washington, DC, area wedding venue is its flexibility. The bride at this Baltimore wedding ceremony was of Beninese origin. Her husband-to-be had immigrated to the Washington, DC, area from Nigeria. Though the future newlyweds shared a common faith, they wanted a Baltimore wedding with elements from each cultural tradition. St. Mary of the Mills Church was happy to accommodate their request. For example, the priests conducted their Baltimore wedding ceremony in both English and French. They also allowed the bride to bring a French-singing choir whose music punctuated the high points of the afternoon. As you can see in this image, the choir’s presence led to some memorable DC wedding photography. While photographing this Baltimore wedding ceremony, we got some great shots of the singers hitting high notes in the song. 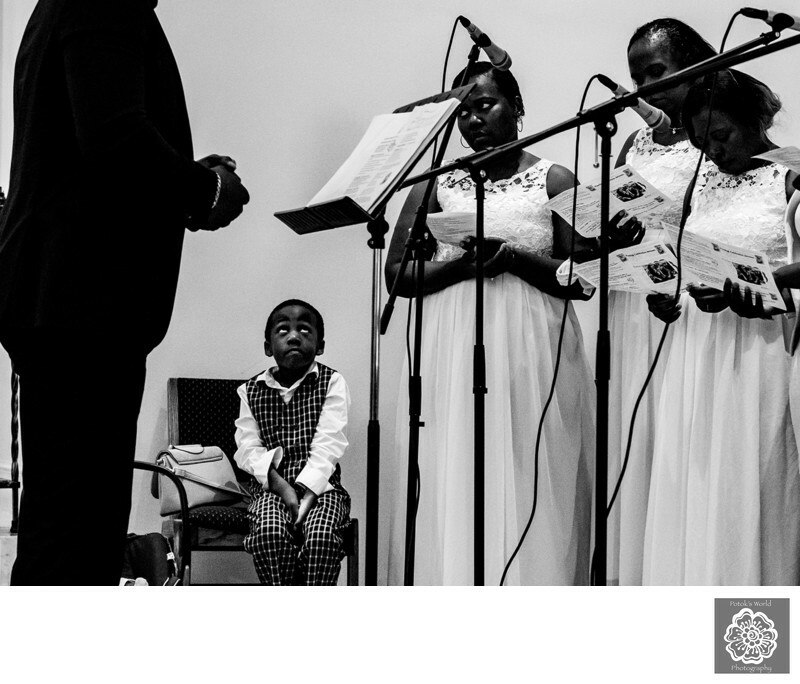 The best image of the day, however, was this picture of a young wedding guest sitting near the singers. We are not exactly sure why he was seated there, but his reactions to the music were priceless. The expression on the boy’s face went from interested to pained to exasperated to bored. When we captured this bit of DC wedding photography, he looked ready for the whole thing to be over. We have mentioned elsewhere on this DC wedding photography website, we often take photos of kids at marriage celebrations. Our approach as Washington, DC, wedding photographers is to take pictures of the moments that make each wedding special. We want brides, grooms and their guests to look at the wedding pictures years later and experience everything anew. Focusing on the children who are at a marriage celebration often helps us tell the story with our camera. Kids generally have no filter, so whatever they are feeling at a particular time is written on their faces. Their reactions can often reflect and accentuate the emotions the rest of the wedding guests are experiencing. Like this little man, they are also very often adorable and make for cute subjects for DC wedding photography. Location: St Mary of the Mills Church, 114 St Marys Pl, Laurel, MD 20707.